Perio Protect® is a minimally invasive, non surgical approach to treating gum disease. Traditionally, scaling and root planing, in combination with antibiotics, is done for the treatment of gum disease. This uncomfortable approach is typically repeated every three months. Also, surgical procedures for advanced gum disease can be painful, and can require frequently on-going maintenance therapy. 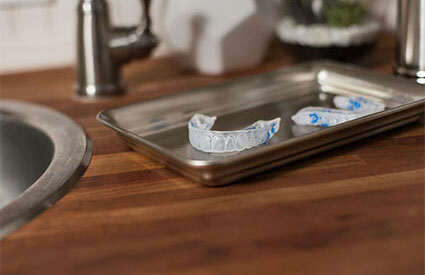 The Perio Tray® by Perio Protect®, is a prescription mouth tray customized for individual patients. It uses an internal seal to get the medication deep below the gums and hold it there to fight infectious bacteria and is typically used for just 10 - 15 minutes a day. More effective disease management is achieved using the daily application of medicine using the Perio Tray®. Contact us today if you are suffering from any of these common gum disease symptoms, or if you believe your gums may be infected and diseased. The Perio Tray® from Perio Protect® , when combined with professional dental therapy and ongoing supervision, can provide minimally invasive, long-term and cost effective care designed to avoid repetitive scaling procedures and surgery.